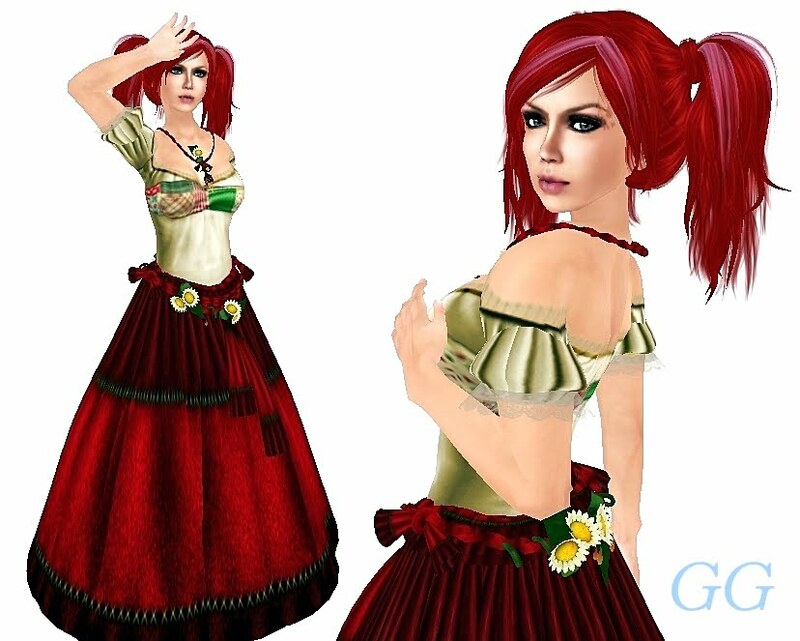 I first saw the Anaphora group gift hair on this blog http://fashionloverstami.blogspot.com/ and I knew right away it would make a great roleplay character. When I went to go look at the store I landed on top of Steffy Ghost, owner of http://artfreebiesl.blogspot.com/ which is blog I had only recently discovered but admire for her ability to turn the every day into art. It was fun to meet her. I knew that meant it would be shown at least twice, but we all have our own spin on items from art to roleplay so I decided to go ahead with the character I had in mind. This one required a trip to Feral Designs which has two mini manias, a few camping chair and 6 lucky chairs. Hair: "Smokahontas_Bole" gift from Anaphora Update Group dated Oct 29 so act fast. Skin: "Citrus Pale" one of five dollarbie skins at Mango, Mango! 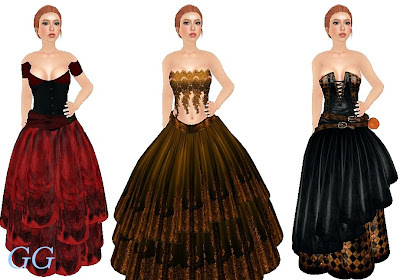 C&N Gorean & Star Wars Designs has three Midnight Manias for Gorean or Medieval women. 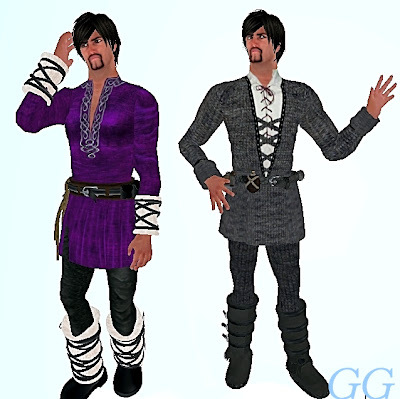 Also two lucky boards with various Gorean and Medieval inspired outfits, one for women and one for men. These are two of the prizes in the men’s lucky board. Boxed Heroes is a great place to visit when looking for a costume or roleplay character. This Arabian Armor AV is free in store right now and can be worn several different ways. 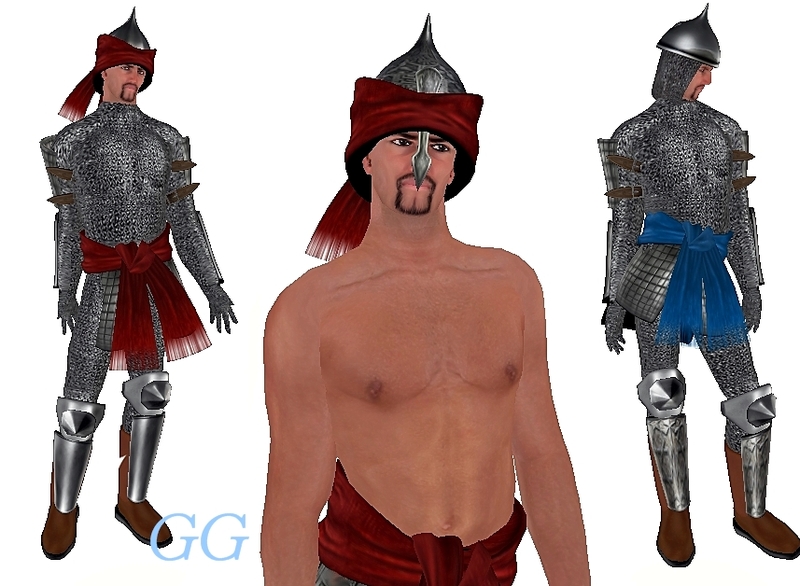 Includes everything seen here: skin, shape, eyes, 4 different helmet options, 2 different sashes and more. 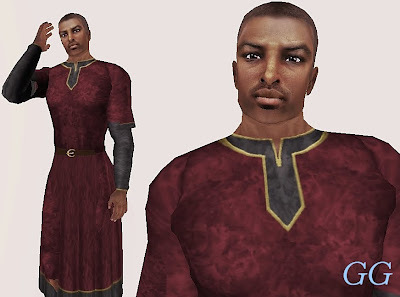 It's not often I have male skins to show you and this post I have two. 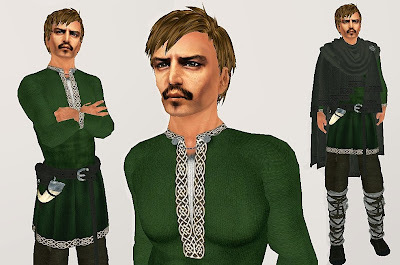 The Midnight Mania prize at Tellaq includes a shape and 3 version of the skin with different facial hair options. The group gift at Aimesi is a men's skin with a blood spot on the cheek that comes in three different skin tones. Join the group and click the sign in store. 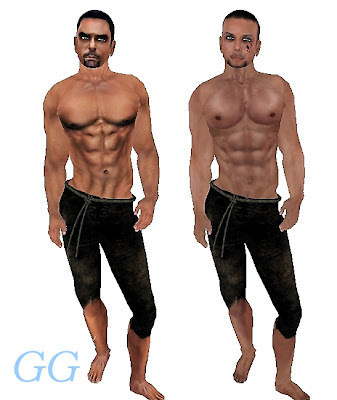 Left: "Gary Skin Style 2" Midnight Mania at Tellaq. Right: "Skin Mike2 Cream" group gift at Aimesi. Shape for both "Gary Shape" Midnight Mania at Tellaq. Pants: "[kk] Mildred Pants ripped" are actually part of a Dollarbie outfit for women at KnickKnack. I think they work well for guys too though. This Johnny Depp inspired avatar is available in the lucky chair at Tellaq. With your own choice of clothing and hair, this skin and shape can easily be used to roleplay in any genre. Here I've dressed him in one of the many outfits available in the lucky chair at Vigo. As always, Vigo provides multiple wear options and accessories. Spring is the time of year when many people start to crave color. 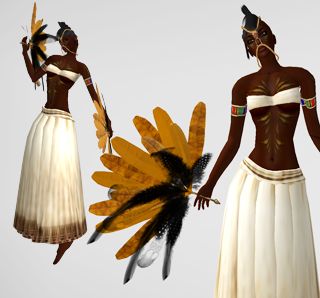 The spring group gift from Aimesi, this skin with butterflies on the face, is a perfect example of that. 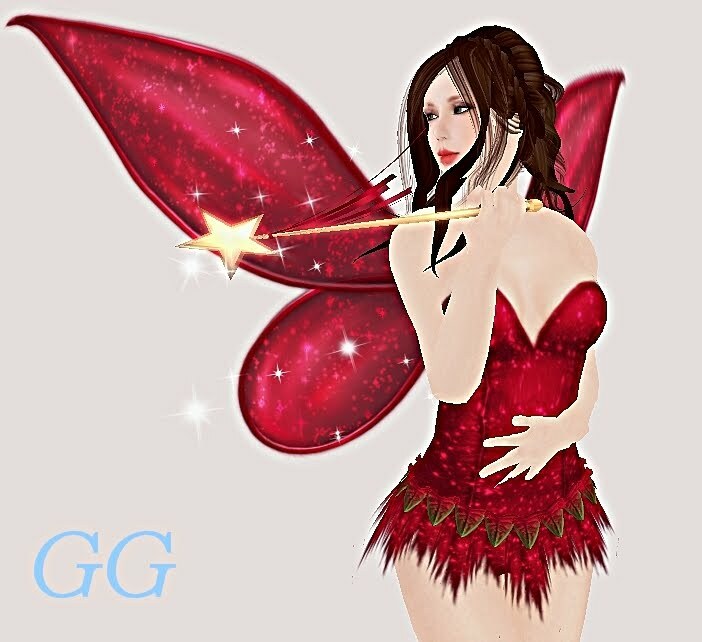 It comes in four skin tones, just wear your group tag and visit Aimesi and click the group gift sign. When paired with this sunny turian camisk from the lucky chair at Gutterpup and one of the hair styles available in the lucky chairs at Vixen and you are ready to for the season. Turian camisks are versatile in that they can double as bathing suits if you prefer a beach to a gorean RP sim. You can't really do spring without flowers. Roawenwood's contribution to the Celebrating Gaia hunt, this meditation garden complete with pillows, will take care of that for you. Find out more about the Celebreating Gaia hunt at the official website. There is a small Easter Egg at Frick. There are 8 eggs in total, 7 of which are skins from the Dream line. Skin tones ranging from tan through chocolate and into fantasy inspired colors all with unique dramatic makeups. Eyes: "Spring Meadow" new gift from Poetic Colors. Hair: "Tapered Bob" from Truth that you already have! 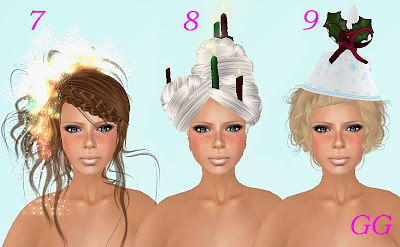 There are several hairstyles in various colors in your SL Library under Accessories and then Hair Design Options. The non skin gift from the hunt at Frick is this Easter inspired mini dress.